You will continue to see the bridal jewelry segment embracing colored gemstones. Experts agree that from all indications it does appear that, the trend to play up bridal gemstone jewelry is here to stay. We cannot point to a single factor that has increased the desirability of gemstones in bridal rings and other bridal jewelry accessories - there is a general environment that favors gems and in a way, plays down the importance of diamonds. In the case of diamonds, a major market share is made up of white (colorless) diamonds. These diamonds are very standardized in terms of cut, shape and quality grading. With this apparent uniformity comes a more or less standard set of diamond jewelry design concepts. Brides today want to express themselves through what they wear, talk and eat. The straight check-and-buy approach of diamond jewelry does not give much scope for personal expression. This is where natural colored gemstones come in, they bring life, vigor and glamor with them. One question that is often on the minds of buyers is whether a gemstone bridal ring would be as durable as a diamond ring. Diamonds were publicized with million dollar campaigns - the Diamonds Are Forever, line is permanently tagged with diamonds. If you had to go with numbers, diamonds with their hardness rating of 10 are infact, the hardest stone to be set in jewelry. Having said that, a diamond can crack or break if struck with physical impact. One of the reasons why diamond rings stay in shape for long is that, the wearer would shower it with tremendous care and caution - this is brought about by a mental trigger that is set off by the high price point of the jewel. Most of the diamond engagement rings that you come across would have diamonds that are 1 carat or below in size. A ring set with a smaller stone has a lower chance of going through stone damage through physical impact. Colored gemstones come in a range of colors and durability ratings, some are tough while others need a bit of attention and care. However the sheer variety of shapes, colors, sizes and cuts available in natural gems, work to deliver bridal gemstone rings that will impress even the most quality and style concious buyer. We will explain the durability of various gemstones through the rings listed below but before that, here is some advice regarding the overall toughness of your gemstone ring. The toughness of the gemstone is just one of the vital factors that will decide the durability of your bridal ring. A well researched design is essential and this will involve factors like, type of gem mounting, metal weight support that take dimensions and ring size into consideration and even the cut and shape of the stone. A good jeweler will know that, the metal weight assigned to your ring will depend on design and overall dimensions. 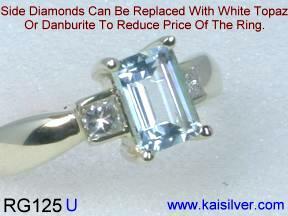 It is not uncommon for jewelers to squeeze metal weight inorder to, offer attractive prices. This is dangerous in the long term as, a light weight gemstone ring can go out of shape easily. Flimsy gemstone mounting is often caused by low metal weight. The gemstone in your bridal jewel can be set in a few ways - prong setting, bezel setting, pave setting or even invisible setting are common. If you choose a square gemstone engagement ring that uses prong settings, the prongs should provide protection for the pointed corners on the stone. This cannot be achieved by conventional single pointed prongs, you will need to use 'L' shaped right angled prongs to cover up the corners. We would say that a bridal ring with a bezel setting for the stones would be ideal but, the look might not appeal to all. Our suggestion would be to begin your ring search by assessing various jewelry providers, Kaisilver is not the only source so do not jump to make a purchase from us. Discuss your detailed requirements and review the quality of answers that the jeweler provides, this should tell you something about reputation and expertise. 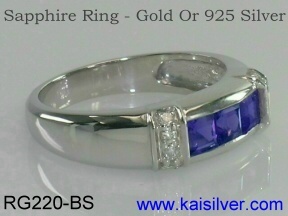 Kaisilver Jewelry: The metal for bridal gemstone jewelry should not affect the degree of toughness of the jewel or the quality of craftsmanship. Many young brides hoping to wear the classic feel of sterling silver find that, the quality of gemstones and worksmanship in silver jewelry is well below par. This is a sad situation brought about by selfish jewelers who prefer to stay with gold or platinum - hoping for the higher profit margins that these metals provide. 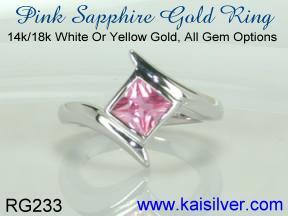 At Kai Silver we have always respected buyer preference for gemstone, design, dimensions and metal. All the jewelry shown on our website can be ordered in gold, sterling silver or platinum. You pick a design and request for modifications and also decide on the gemstone of your choice. And if you have a specific design idea on your mind, send us an image or rough sketch and we will work together on finalizing specifications. Our support experts at sales@kaisilver.com will be glad to help you, so grab the benefit of their expertise before finalizing your purchase. We custom make all kinds of fine jewelry, the design, metal and gemstone can follow your choice. We have sprinkled this page with some excellent examples of rings that would be suitable for you. 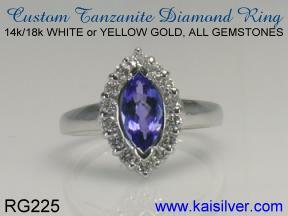 Tanzanite: If diamonds with their rarity seem ideally suited for bridal jewels, consider Tanzanite. This gemstone is rarer than a diamond and is mined in just one small patch of land in the world. For durability of a bridal tanzanite gem, we would suggest a modest gem size and a gem mounting that does not raise the gem too far beyond the surface of the ring. The RG225 from Kaisilver flashes a fine custom cut marquise tanzanite gem, the center gemstone is closely hugged by a row of glittering diamonds. We have details for this awesome bridal jewel suggestion here. Amethyst: A rather unusual suggestion for a bridal ring, amethyst is affordable and has an ancient history. The RG141 claddagh ring demonstrates how bridal jewelry design can add beauty, meaning and durability to the jewel. With it's 4 century old tradition, the claddagh ring is regarded as one of the most meaningful jewels in history. The Kaisilver claddagh ring retains the features and meaning of the first claddagh ring crafted by an Irish slave almost four centuries ago. The gem mount in this ring protects the edges of the gem from side impact by bordering the entire edge with metal. 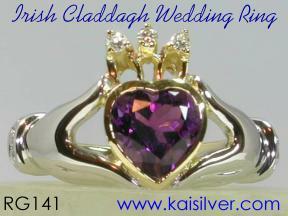 You get to choose the metal and gemstone for your claddagh wedding or engagement ring. Check out the range of options available for this ring here. Aquamarine: Comes from the same mineral family (beryl) that emerald does but, is a lot more tougher than an emerald. A light blue gemstone awesome in white or yellow gold. If you are looking for a bridal gemstone ring that speaks style without shouting out loud, patronize the aquamarine. You don't have to worry about matching an aquamarine engagement ring with your wedding attire, the gem will never appear loud or flashy. The possibility of choosing the gemstone of your choice, makes this gorgeous ring a great choice. Read all about this aquamarine diamond ring here. Sapphire: A gorgeous selection of pink, blue or yellow sapphires for you to choose from. With historical links to royalty and status, it is not surprise that this is a popular gemstone for bridal gemstone jewelry. The sleek design in the RG233 ring, is backed by a substantial metal weight - this ensures a comfortable wear and toughness. Some other gem options that come to mind for this sapphire bridal ring - green or pink tourmaline, tanzanite, iolite, spessartite or ruby. Notice how our design experts built in durability by, covering the all edges of the sapphire with metal. Review all details for this sapphire ring here. Sapphire : If your lifestyle involves a lot of hand related activity, choose a bridal ring that can keep pace with the wear and tear. This blue sapphire bridal ring, has three modestly sized sapphire gems. The gemstones are firmly mounted with a channel setting, the stones are mounted with a low profile - this reduces the chances of the gems getting hit by physical force. The RG220-BS blue sapphire engagement ring, is a good concept for those of you who wish to have three or more gems in your bridal ring. If you wish to get a pair of wedding rings, this is a concept that is suitable for both men and ladies. Get more details and pricing information for this ring here. 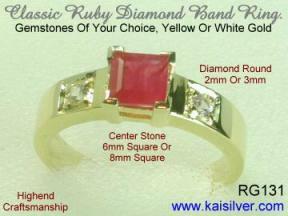 Ruby: The RG131 ruby engagement ring from Kai Silver perfectly demonstrates the right way to mount a square gem. The prongs are right angled thus protecting the corners of the gemstone from damage. The diamonds on the shoulder of this ruby ring add style and interest to the jewel. Available in 14k or 18k white, yellow or rose gold. You cann also order this ruby ring in sterling silver. No matter which gemstone you plan to put in your gemstone ring, this concept is perfect for a square or rectangular gemstone. Review all details for this ruby bridal ring here. Emerald : Known for many thousand years, emerald along with ruby and sapphire shares the prestigious 'Big Three' title. The RG212 emerald bridal ring is designed keeping the physical characteristics of the gemstone in mind. 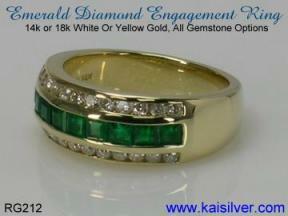 With natural emerald always showing internal inclusions, the durability of the gemstone is an issue to be considered. By restricting the gemstone size to 3mm or 4mm square emerald gems and providing a secure channel setting, our experts have undoubtedly made this ring more durable and longlasting. You can request for the gems and diamonds in this jewel to go all around the ring - like a conventional eternity band ring. Get to know more about this awesome ring here. 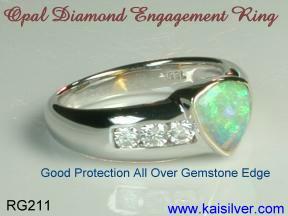 Opal: The gemstone for just about any occasion, white opal ring with diamonds. By sourcing genuine Australian white opals directly from the mines we ensure that, you get the world famous gem and not the lower priced option from Ethopia or any other source. Your opal engagement ring can be crafted as per designs that you send us or you could go for the RG211 trillion opal gemstone ring. The design concept for this opal diamond ring, reveals the entire beauty of the gem while protecting it to a great degree. If you plan to wear just one bridal ring for the engagement and wedding, this is the ring to choose. We have more details and options for this gorgeous ring here. 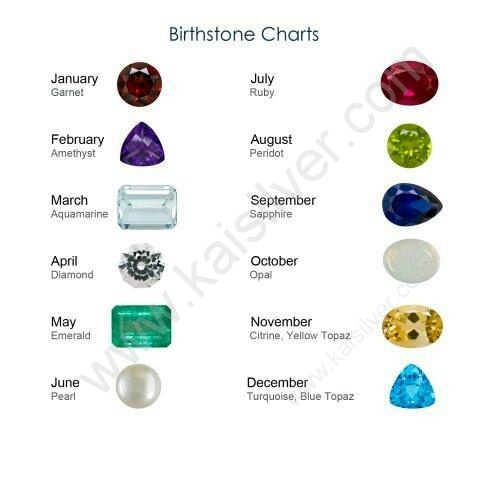 And if you wish to be inspired with the centuries old tradition of birthstones, refer to the Kai Silver birthstone chart below. An engagement or wedding ring is truly a jewel that involves two special individuals, brought together by the desire to spend the rest of their lives together - as one. Your bridal jewel could assemble your birthstone and that of your spouse. But if you wish to keep just one birth stone in your wedding or engagement ring, you might want to exchange birthstones - this adds a special meaning to the jewel.